For a model company to mold and manufacture a Spitfire model kit they must be brave enough to sprint through the minefield of intense scrutiny. Fans of the Supermarine Spitfire/Seafire tend to be hard-nosed, diehard, take-no-prisoners type of loyal supporter who have no parallel in the modeling world. When a new kit of any mark is released, these fans measure it, then re-measure it, and measure it again. Then the comparisons between the kits start, and they never seem to stop. The commentary on these kits seems to go on and on. The purpose of this article is not to go into the history of Supermarine’s Masterpiece. There is not enough space to do so. I will therefore leave the history to those who write so much better than I such as Dr. Alfred Price. Instead, the intent is to compare the three latest 1/48th scale renderings of the Spitfire Mk.IXc in plastic: the ICM, Ocidental, and the newest Hasegawa. I have not included the Monogram Mk. IXc nor the Otaki/Arii/Airfix Mk.VIII/IX . These kits suffer from fatal, hard to correct shape errors and are not molded as nicely as the latest three kits. These two kits also suffer from major detail omissions and inaccuracies. Both kits are best left to the collector. I have also not included Spitfire Mk. VII, VIII, IXe, or XVI, as I wish to compare navel oranges to navel oranges and not navel oranges to juice oranges. The main players, ICM, Ocidental, and Hasegawa have been measured and commented on. There has been some comparison, but in prose only. The purpose of this article is to, hopefully, put all this information in one place so the modeler can make up his or her mind as to which kit they would prefer to build. By explaining how I compared each kit to the others, I hope the reader will better understand the comparisons. First of all a really good set of plans was necessary. The plans I used were found in “Spitfire: The Canadians” by Robert Braken and drawn by A. R. Clint. These plans appear to be the most accurate in print. These plans were read directly, and were not enlarged to avoid any parallax effect distortion from the enlarging process. Certain kit parts were measured using a rule which was graduated in both 1/48th scale feet and in millimeters. The measurements were compared to measurements from the plans, measurements done by Olav Hunges and measurements I took of Spitfire Mk.VIII, MT417 of the Cavanaugh Museum in Texas. A table containing some of these measurements is attached at the end of this article. One of the failings of most the commentators is the lack of visual comparisons between the kits. I therefore taped each part, or laid each part next to it counterpart. I then took a digital image. This graphically illustrated the differences between each kit. As this article was intended to concentrate on the general overall shape, I glossed over the detailing of these three kits. And finally the optional parts and decals from each were compared. Remember the views expressed are mine, and mine alone. When Ocidental announced the pending release of their Mk.IX, there was a sense of joy as a mainstream manufacturer was going to do a Mk.IX. Joy soon turned to disappointment as Ocidental had made a major mistake with the nose of the Mk.IXe kit. This kit was then thoroughly trashed as being fit only for the scrap box. This criticism was way too harsh. When Ocidental released their Mk.IXc and the Mk. XVI, kits they made an attempt to fix the nose. The Ocidental Mk. IXc is a simple kit, but has a few omissions and errors in shape. Though an attempt was made to fix the nose, it still is not quite right. The tail wheel is oversized and the wheels and tires are bland as are the radiators and cockpit interior. The spinner will need replacement. The wings appear to be in scale. However the trailing edge is a little too rounded due to the chord being too broad at he widest part of the wing, and the roots will have to be filed so the wing will have the correct dihedral. Most of the errors and oversights can easily be corrected with a file and some of the many resin parts that have been produced for this kit. Ron’s Resins and Aeroclub are two of the manufacturers that come to mind. However the list price of $30.00 ( US )is a drawback. All is not lost with this Mk.IXc. The kit is basically in scale, and the shape is acceptable ( with the exception of the nose). The kit is reasonably easy to build. With the few corrections mentioned the kit builds into a nice model. The MPM MkIXc/e is the Ocidental IXe with different decals and a bag of resin parts and sells for less than the original kit. Even more anticipated than the Ocidental kit was the ICM series of Spitfires. These, however, had a very shaky start. Quality control was lacking which led to packaged kits missing sprues, having short shots, lots of flash, and, one of the kits I purchased was the wrong kit in the right box (or the right kit in the wrong box?). ICM however cheerfully replaced parts, sprues and entire kits when asked. There are a lot of parts packed in the flimsy cardboard box. The nose of this kit has been over-engineered to have a Merlin engine, the source of most of these parts. This is not fatal though. The nose has the correct shape to it. The main flaws with this kit are the potential for excessive flash, short shots, and missing sprues(though these problems seem to have been fixed) and sink marks. Additionally, the undercarriage is a bit long, the wheels need replacing, as do the prop and spinner. Plus that multi-piece nose is a pain to assemble. All of that aside the ICM kit scales out almost perfectly. The panel lines are fine and the actual molding of the kit is improving constantly. The IXc kit has a plethora of optional parts (cannon bulges, stabilizers, armaments, and such), a set of very nice bomb racks, a fairly nice interior along with 6 decal options. The kit has an accurate outline which makes it very attractive. After the quality control problems with the ICM kit, the Hasegawa Mk.IX was eagerly anticipated even more than the ICM Mk.IX . With Hasegawa’s recent releases it was assumed that this kit would be the ultimate Mk.IX kit. Reviewers have sung the praises of this kit in more than one forum. Though molded very nicely something does not look right with the kit. When compared to the ICM and Ocidental kits, it is evident that the Hasegawa kit is too short in length. This throws off where the wing (which is in scale!) sits on the fuselage, making the taper from the cockpit to the rudder too pronounced. And the spinner is too long. The Hasegawa kit looks decidedly odd. The molding, a beautiful interior and a good prop cannot help the kit. Whereas the faults in the Ocidental and the ICM kits are easily corrected with a spot of filler, some sanding or a few resin pieces, the Hasegawa’s faults are extremely difficult to fix and therefore fatal. 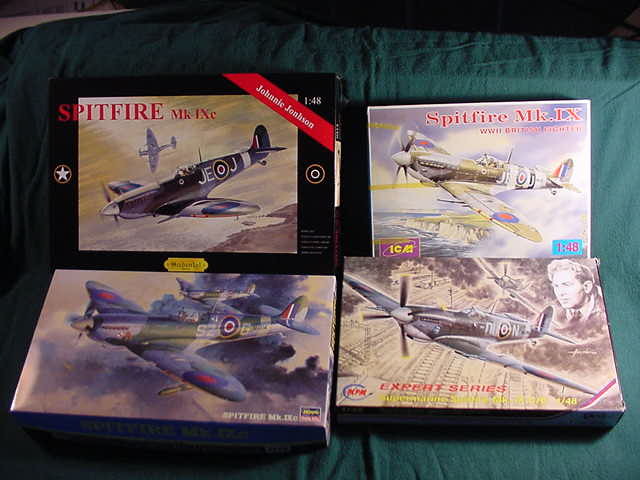 All three of these Spitfire MkIX kits come with some extra parts. The amount ranges from a few parts in the Ocidental and Hasegawa kits to a lot of parts in the ICM and the re-boxing of the Ocidental kit by MPM. The Ocidental MkIXc has few options included. You get wing and centerline bomb racks with two 250 lb. and one 500lb. bombs, and the early and late “C” wing bulges. The bomb racks are fairly basic. Only two decal options are given. The MPM boxing of the Ocidental Mk.IXe contains all of the Ocidental pieces along with a bag of resin parts which include: clipped wing tips, an early intake, early stabilizers, early and late “C” wing bulges, “E” wing bulges, new tires, 3,4,5 and covered spoke wheels, and a set of “C” wing cannon. These are in cream colored resin and are done really well. MPM also includes a decal sheet with 5 options, which including early to late “C” and “E” winged aircraft. Hasegawa is not as generous as MPM. It does come with the Mk.VIII tail wheel, doors and wheel well, three sets of cannon, two sets of exhausts, and a nice set of wing bomb racks. Only two decal options are provided, and both of these are wrong. Oh boy if you like extra parts you will love this kit! Parts include: early and late tailplanes, early and late “C” bulges, early, late and MkVII style intakes, two sets of cannon fairings, wing and centerline bomb racks (very nice! ), two sets of cowling sides, standard and clipped wing tips, a pressurization intake, rockets and rails, a 75(?) gallon slipper tank, a slightly underscale Merlin engine, .50 cal. machineguns, 20mm cannon, and decals for 6 aircraft. 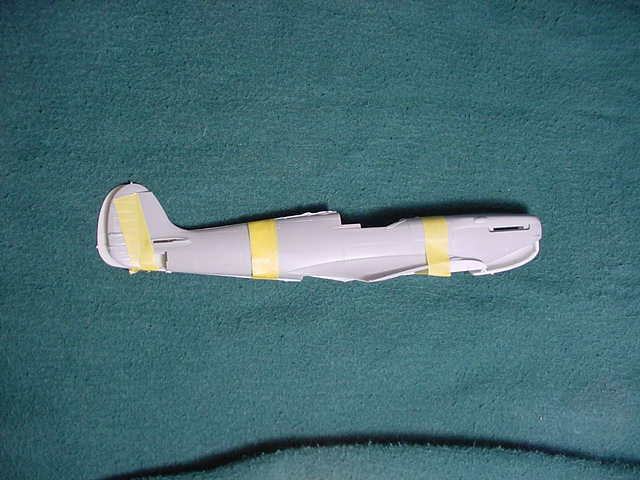 When taped together it was found that the two fuselage halves were practically the same length. The wing was located in the same area as were the tailplanes. The front edges of the cockpits matched with each other, but the windscreen, canopy, and backlite all seemed to be a bit longer in the ICM kit. ICM and Ocidental, ICM at the bottom. This shows the similar length and differences with the cockpits. The thrust lines of both the Ocidental IXc and IXe are about 2mm too low. Both the Ocidental and ICM fuselage halves match very well along the rear, from the cockpit to the tail . The ICM has a wing span of 37feet 9 inches, and the Ocidental has a wing span of 37 feet. The actual wing span is published to be 36 feet 10 inches. The ICM wing has the better shape, due to the Ocidental wing being a bit too broad in chord at the thickest point . ICM and Ocidental, with ICM on top. This shows the Shapes of the two wings. The Ocidental is too broad. The Ocidental rudder tends to be slightly more rounded, and has a better shape. Ocidental has better propeller blades, and ICM the better spinner. When comparing the ICM to the Ocidental, the ICM is the clear winner. 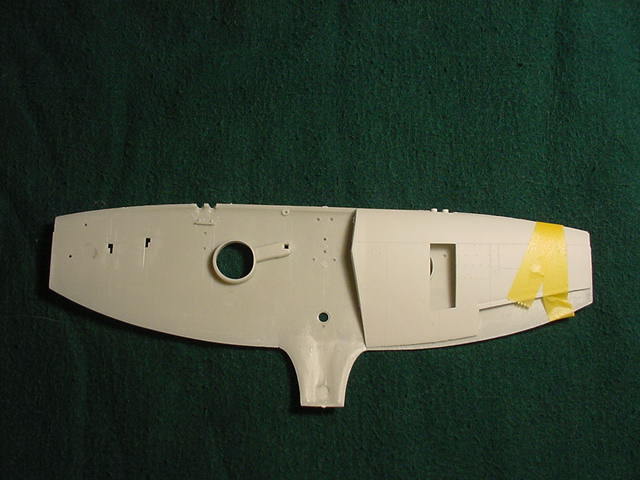 With Ultracast’s parts, a very nice Spitfire can be built. The ICM has the better shape and better detailing. It has to be remembered that all of Ocidental’s shortfalls are easily corrected with the numerous resin sets that have been released. A no-brainer most people would think. But this comparison is not so clear cut. 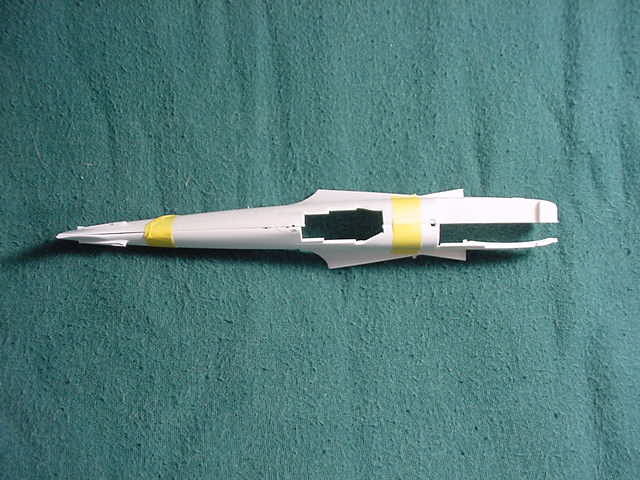 When the fuselages are taped together the Hasegawa is 4 mm short in the tail, and 1.5mm short in the nose. This throws the relationship between the wing, cockpit, and tail out of whack. Hasegawa and Ocidental, Hasegawa is dark grey. 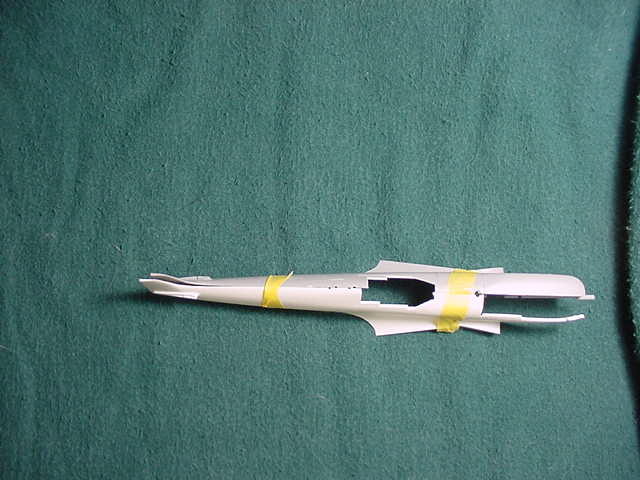 This image shows the shortness of the Hasegawa fuselage. 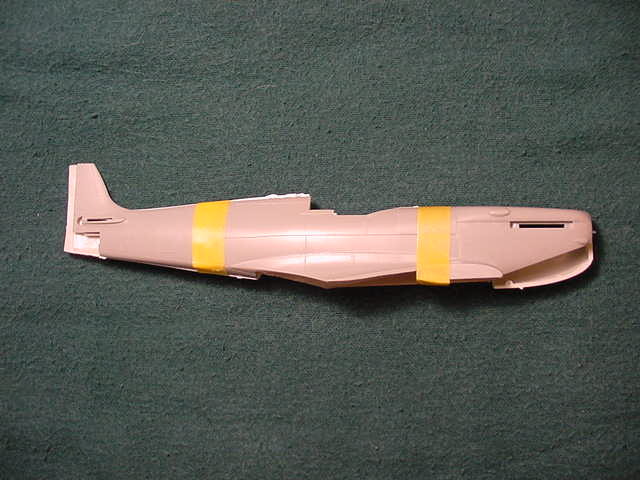 When you add the rounded tail to the fuselage, the back of the Hasegawa kit becomes 5 mm too short. 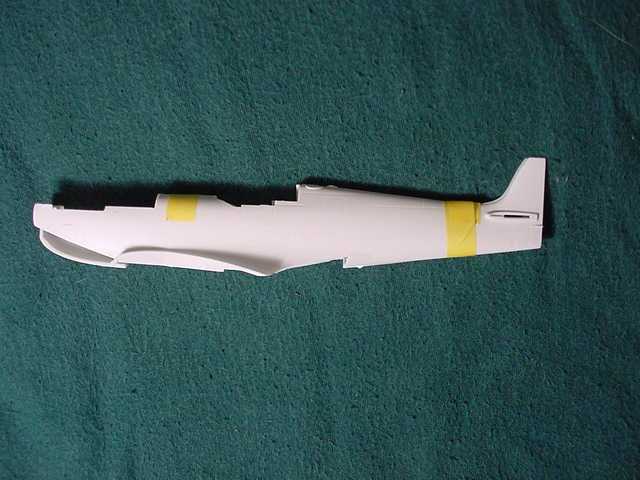 Add to this that the fuselage is also 1 to 2mm thinner all the way to the tail. Hasegawa and Ocidental. Hasegawa is dark grey. The differences in the length and thickness of the fuselage are shown here. The thrust line of the Ocidental is 2mm too low compared to the Hasegawa kit. The span of the nicely moulded wing is 37 feet 6 inches verses Ocidental’s 37 feet. Hasegawa’s wing appears to be more accurate, and Ocidental’s being too broad (by about 2.5mm). The rudder is slightly broader (1.5mm) in Ocidental’s kit. Having a nice shape, Ocidental’s prop is 11 feet in diameter (caused by an overly large spinner, that nose!). The Hasegawa prop is 6” too short in diameter, at 10feet 3 inches. So which kit is better? There is no question that the Hasegawa kit is better detailed and better molded. But the defects in shape with the Hasegawa kit are very hard if not impossible to fix. When built it does look odd. The shape errors on the Ocidental kit are easy to correct with the multitude of resin parts out there. The easier build for a correct Spitfire IXc would be the Ocidental Mk.IXc. Basically the same problems that the Hasegawa had versus the Ocidental kit, it has with the ICM kit. The shortness in the tail and nose throws off the relationship between the wing , fuselage, cockpit and cowl. Hasegawa and ICM. Hasegawa is dark grey. Top view shows the difference in length and the cockpits. Also note the positions of the wing fillets, and horizontal stabilizer fillets. 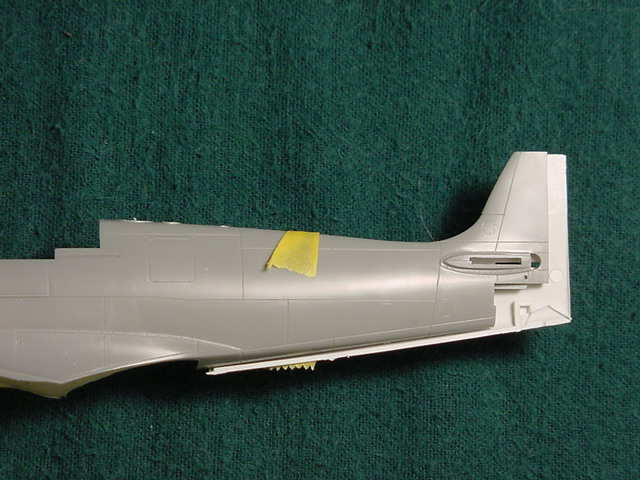 Hasegawa’s fuselage is also 1mm thinner along the entire length to the tail. Both wings are nicely shaped, but are slightly to long in span (Hasegawa 37feet 6 inches and ICM 37 feet 9 inches). The rudders are similar with the Hasegawa slightly better. Hasegawa has better shaped props, but is a scale 6 inches too small in diameter. ICM’s prop has the proper diameter (10 feet 9 inches) but the blades are too broad in chord. Lastly the Hasegawa does have the better interior. Hasegawa and ICM, Hasegawa is grey. Close-up of the tail area showing the difference between the thickness’ of the two fuselages. Which is better? Hasegawa’s shape errors make it very hard, if not impossible, to do an accurately shaped Spitfire. The quality of the molding and its detailing does not save this kit. Though not quite as well molded, the ICM kit is still very good. Though some detail parts should be replaced (easy to come by), it is more accurate in outline than either of the other kits. The clear choice here would be the ICM kit, because of its detailing and better shape. So after all of this analysis, what do we have here? There is a Mk.IX, which is nicely detailed and molded but shaped out of scale and odd. The second is molded okay but does have some shape problems. And a third, which is in scale, nicely detailed but may have some quality control problems. The first, the Hasegawa kit, IS molded very nicely and is beautifully detailed. But it has shape problems, which are very hard to correct, if they can be corrected. That fuselage being as out of shape as it is distorts the relationship between all of the major components. These are obvious when placed next to an ICM Mk.IX, as the Hasegawa looks, well, odd. The second, the Ocidental Mk.IXc does have some shape problems, but with sandpaper and some resin parts these faults are easily corrected. The third kit is the ICM Mk.IX. This kit has a very good shape to it, it is in scale, and is fairly inexpensive to purchase. Yes, some of the parts should be replaced (such as the wheels and landing gear) but there are a whole bunch of optional parts (such as bombs, rockets, tails) and 6 decal options. Though a well-known modeler considers this kit to be junk, it IS the best MkIX as far as accuracy and scale. My recommendations (remember they are MY personal preferences) will certainly cause a stir, but here they are anyway. If you wish to build a nicely molded kit, and really do not care for accuracy, then build the Hasegawa. If you want to build a kit that is fairly easy, and looks fairly good when finished, then build the Ocidental. If accuracy and detailing is what you want then the ICM kit is the only way to go. * MT 417 is a Spitfire Mk.VIII located at he Cavanaugh Museum in Texas. The 1:1 measurements were converted into 1/48th scale. Note that all of the measurements are in millimeters . Special thanks to: Joe Lyons and Tom Smith of Southern New Jersey Scale Modelers, Robert Swaddling, and to Dana D’Amato for the inspiration to write this and for proof reading this article.